Rabbi Maury Grebenau is the principal of Yavneh Academy of Dallas and a passionate advocate of math education. 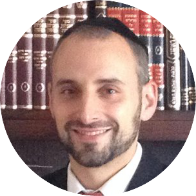 Rabbi Grebenau has a BS in Mathematics from Yeshiva University and worked briefly as an actuary before entering the field of education. He enjoys teaching Math, especially Calculus, and is very supportive of ventures which promote excellence in both Judaics and general studies. An organization dedicated to promoting and contributing to the development and growth of mathematics among the new generation of Jewish youth by holding international competitions and establishing a network of Jewish teens passionate about math.